a functional as well as beautiful place for your family. Many clients call us wanting an enhanced entertainment area to take advantage of their natural setting. In this case, the client selected synthetic turf for year round use. ...and transform them into your awesome focal point. to a durable Thinset update. to low maintenance, non-slip surfacing. Dzingle's Landscaping is a family owned and operated business that emphasizes personalized quotations to promote a more comfortable contractor/client relationship. Please click on our links below to view our array of works. 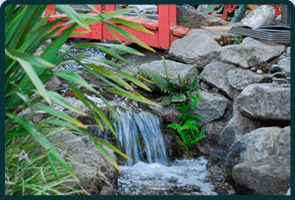 Water Features are the hottest trend in landscaping today. High maintenance lawns, with Washington's water and moss problems, can be transformed into beautiful low maintenance water features. Whether you have a natural slope or a yard with a flat terrain, we can create one of these natural looking and environmentally-friendly customized features. We all love the feeling of grass between our toes on a beautiful summer day however; all of us in the Northwest knows the challenges of maintaining the quality of natural turf. Over the years, synthetic turf has had a revolutionary transformation from "Astro Turf" to an incredible appearance and feel to real grass. Installation of Synthetic Turf makes you truly a steward to the environment. Let us help you "go green", you'll contribute with water conservation, absolutely no use of harsh chemicals and enjoy the cost savings of no maintenance. One of the great ways to enjoy your landscape is to install structures such as decking, arbors, and fencing, to name a few. These items can make non-functional spaces useful. They are great for screening and privacy. And they can enhance dimension. As with all contracting services, Dzingle's Landscaping realizes our customers have choices when choosing who will do their work. Upon getting the opportunity to perform your work, we will provide a thorough and concise estimate. 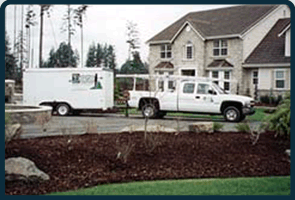 Dzingle's Landscaping emphasizes on personalized quotations and promotes a more comfortable contractor/client relationship. Dzingle's Landscaping, L.L.C. 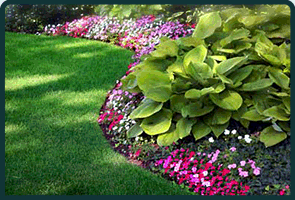 is a full service landscape company that contracts all your landscape needs from design, installation to maintenance. All aspects of your job are performed to the utmost in quality to insure your satisfaction when your project is completed and most importantly, for years in the future. 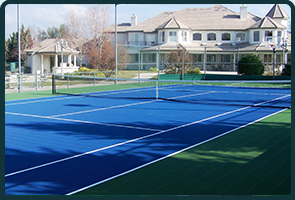 Our sport court tiles are supplied by FlexCourt, a global leader in high performance modular sport surfaces. In fact, we were one of the first to bring this type of high-quality, sport enhancing floor to the table. Why limit yourself to enjoying your beautiful landscaping to only during the day? 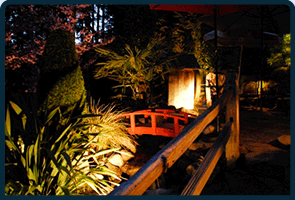 Landscape lighting done properly, compliments the aesthetic value of your property as much as any other enhancement method. Utilizing new generation LED lighting systems, the goal is to use shadowing/spill lighting to enhance trunk structure, branch and leaf texture, and surrounding terrain. The type of lighting fixture, quantity of lights, and proper placement, are key elements on achieving a more subtle resort feel rather than an obtrusive glare that negates dimension and appeal. Russ and Doug often encourage prospective clients to visit the gardens at the shop to view the ponds and waterfalls and see all the different facets of landscaping. Dzingle's Landscaping, L.L.C. is a family owned and operated business formally established in 1980. 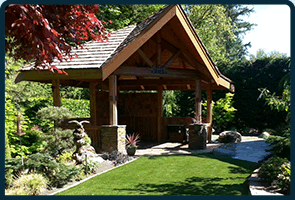 With over 33 years of hands on experience, owners Dave, Russ and Doug Dzingle and their knowledgeable staff contract large commercial projects to small residential landscapes. Having contrasts, whether it be color, texture, or structure, can set your landscape apart from all others. 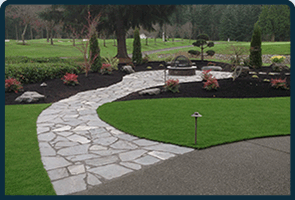 Impervious surfaces always has its place in adding to the beauty of your yard. 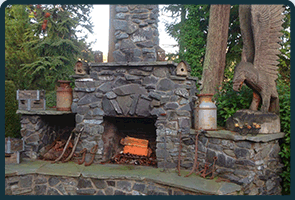 Whether it's a large wood burning fireplace or a natural gas fire pit, make it a focal point to your outdoor living space. There is nothing like the feeling our clients get when they come home to a freshly mowed lawn and shrub bed areas raked to a manicured appearance. Our highly trained landscape maintenance crews and their equipment are at the ready to provide professional, reliable maintenance service to enhance the beauty of your ever-growing landscaping. With water conservation being at the forefront every season, watering efficiency is key. Dzingle's designs and installs commercial and residential sprinkler systems using the latest in modern components of which leading manufacturers provide. These systems are becoming increasingly popular because of their efficiency, insuring your landscape has water provided when it need it most, and not having to hassle with unsightly hoses. Have a system installed today and you'll wonder how you lived without the convenience and efficiency of an automatic sprinkler system. With quality control of the utmost importance in any service and construction industry, Russ and Doug are "in the trenches" with the crew to insure the customer's satisfaction. 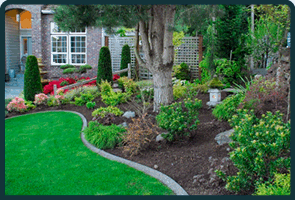 Dzingle's is a fully licensed and bonded landscape company for your confidence and protection. Dzingle's and their estimating staff are ready to implement your dream landscape from start to finish.